When working with audio, one typically wants as quiet a system as possible -- no one likes listening to hiss. 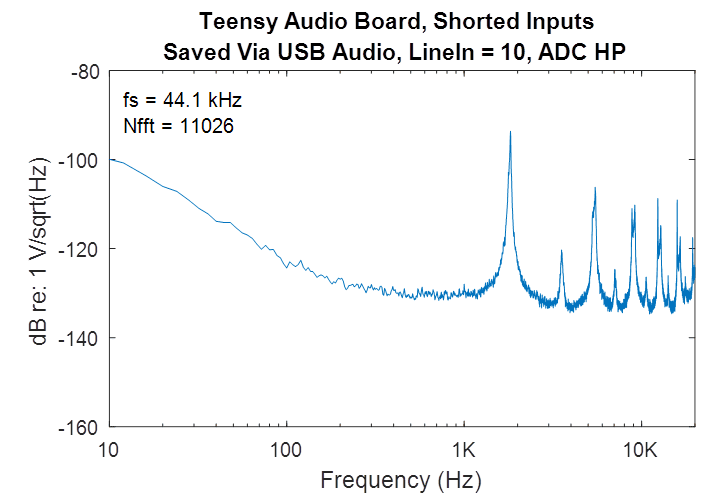 So, when I started working with the Teensy and the Teensy Audio Board, I applied a critical ear to the board's performance. While the Teensy Audio Board was very fun, quite easy to use, and relatively inexpensive, I found that it was noisier than I like. In this post, I'm going to illustrate the noise levels that I recorded and I'll show a workaround that helped remove a lot of that noise. Setup: For these tests, I used a Teensy 3.6 attached to Teensy Audio Board. 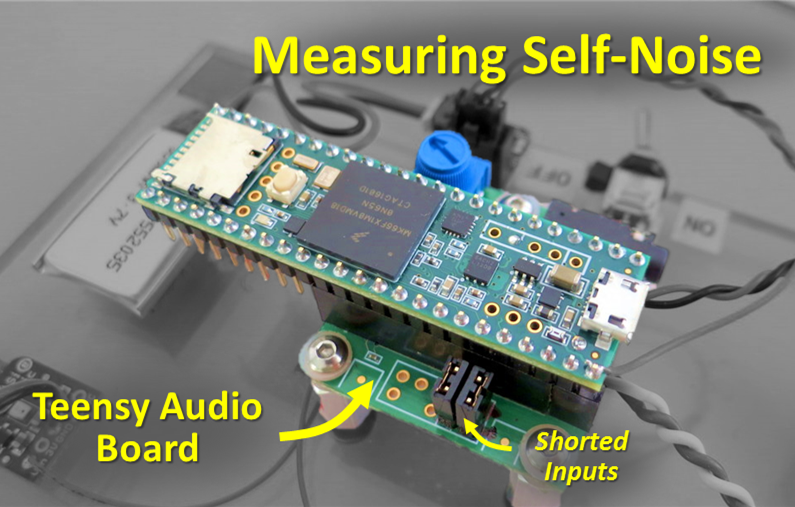 I then wrote an Arduino sketch (shared on my GitHub here) that would record audio from the line-in and send it to both the headphone output as well as to the USB Audio output. 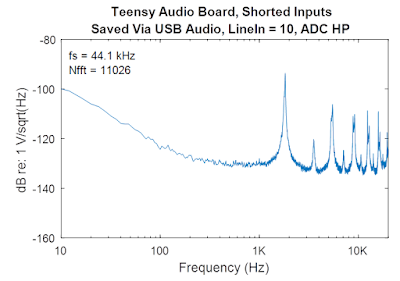 I recorded the digital audio coming through USB using Audacity (as discussed here). As shown in the picture above, To try to isolate just the self-noise of the system, I shorted the inputs using a jumper across the Teensy Audio Boards line-in terminals. This should be as quiet as it can get. First Results: The audio that I recorded (shared here) sounded funny to my ear. If I turned it up, I could hear a very annoying unsteady whining noise. Looking at the spectrum (see plot below), I could clearly see some narrowband tones starting around 2 kHz. That's right where one's hearing is most sensitive, which makes this kind of self-noise particularly problematic. It's definitely not what you want if you're trying to make a hearing aid type of device. What could be the cause of this? 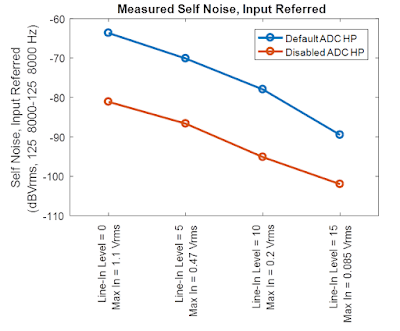 Disable the ADC's HP Filter: After a bunch of messing around, I finally stumbled across this post on tthe Teensy forum. Here, "Raj" stated that the SGTL5000 audio codec (which is at the heart of the Teensy Audio Board) has a high-pass filter in its ADC. He said that this HP filter was introducing a lot of noise and he shared the command for disabling that filter. When I put the command "adcHighPassFilterDisable();" into my sketch and re-ran my tests, those annoying narrowband tones in the Teensy Board's self-noise went away (audio file here). Ahhh. That's so much better. Varying the Gain: The data shown above were taken with the input gain of the Teensy board set to "10" (ie, full-scale input spans 0.56 Vpp). There are other gain settings that one could use. So, I repeated my measurements at other gain levels to see if the input-referred self-noise was better or worse. The results are below. As can be seen, the noise with the HP filter (the blue line) is noisier in all cases than when the HP filter is disabled (orange line). So, as long as you can handle a little DC offset in your audio data, you should definitely disable that filter. 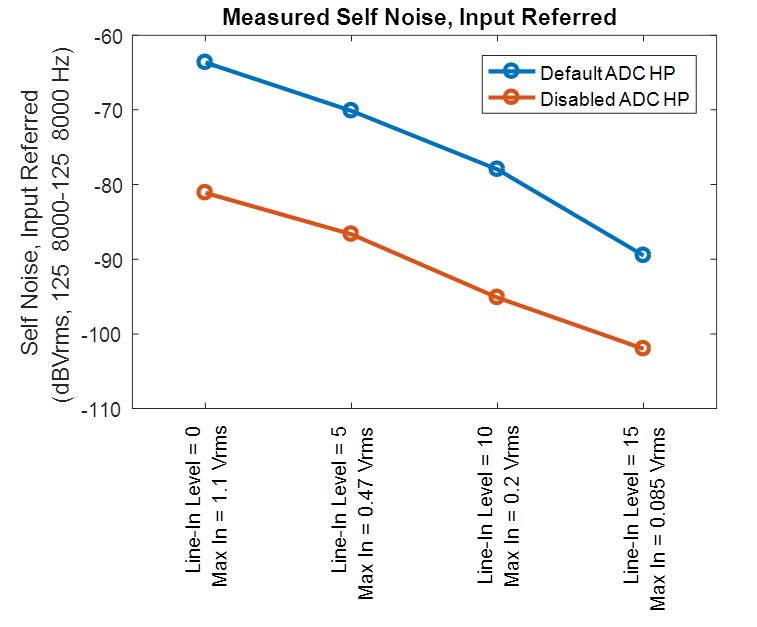 A second finding is that the apparent (input-referred) self-noise goes down as the gain increases. So, if you have really quiet signals that you're trying to record, turning up the gain might help reveal those signals. 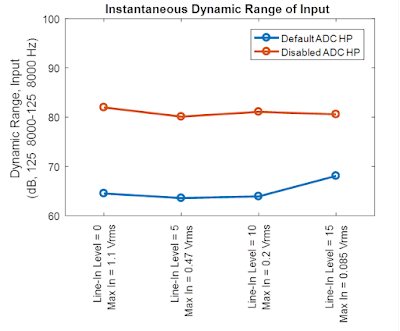 Dynamic Range: The trade-off with turning up the gain is that the maximum signal level that can be recorded without clipping also goes down as the gain is increased. For many applications, therefore, it is just as important to look at the dynamic range for the system. The dynamic range is the difference between the maximum input level and the noise floor. 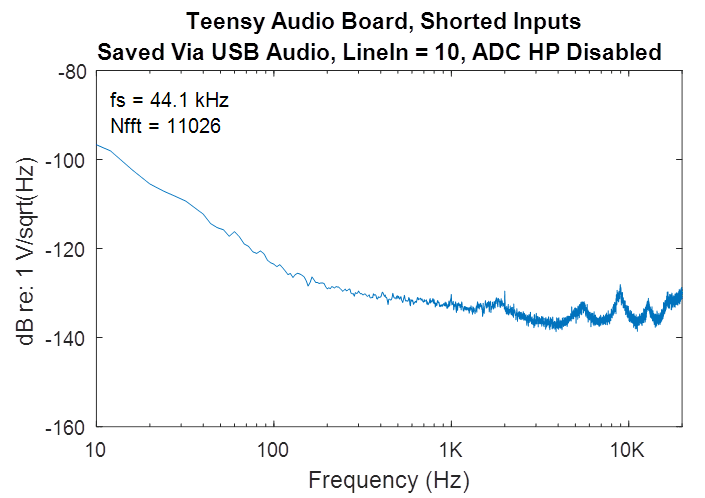 When I run the numbers for the Teensy Audio Board, I get the results below. 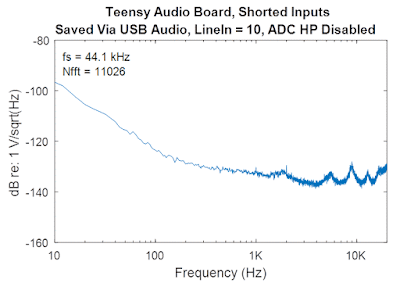 Here, I see that, when the HP filter is disabled (the orange line), the Teensy Audio Board has about 81 dB of dynamic range. 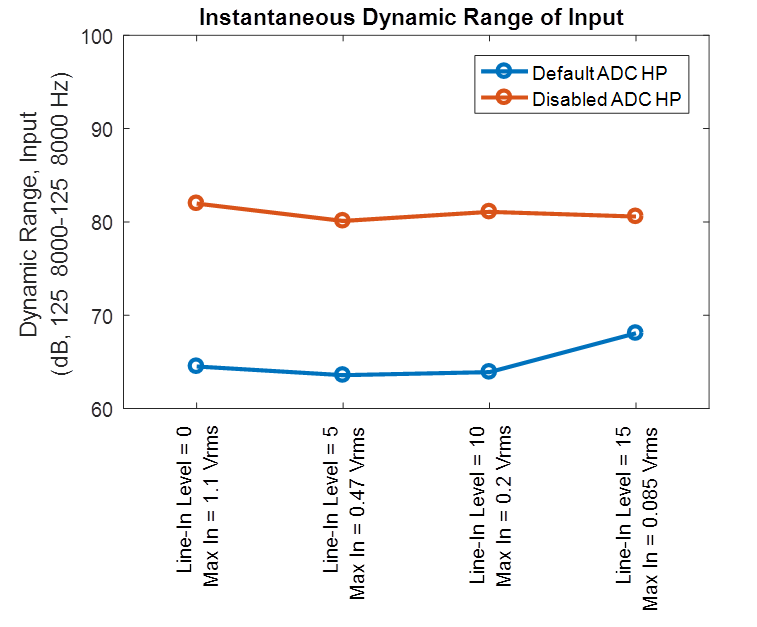 And, I also see that the dynamic range is basically independent of the gain setting. Is it Good Enough? So now we're down to the hard question: is 81 dB of dynamic range good enough for my needs? Well, it is a pretty decent number, especially for the price of the Teensy Audio Board. But, for my use as part of an open-source hearing aid, where I need to amplify quiet sounds while not distorting on already-loud sounds, I think that I need a bigger dynamic range. Normal human hearing spans on the order of 120 dB of dynamic range. I think that I need hardware that'll get me at least a little closer to that number. Motivation for a New Board: The results shown here were my motivation for building the audio interface (the "Tympan") that I introduced in my last post. In my next post, I'll share some details of that audio interface and I'll perform these same self-noise measurements to see if I was able to get a wider dynamic range. Making wide dynamic range systems isn't easy, so it'll be exciting to find out how I did! Follow-Up: I measured the self-noise and dynamic range of the new Tympan board. It's pretty good! If you're interested, you can see the results here.